If you need a traffic mirror in a hostile environment then stainless steel is the material for the job. 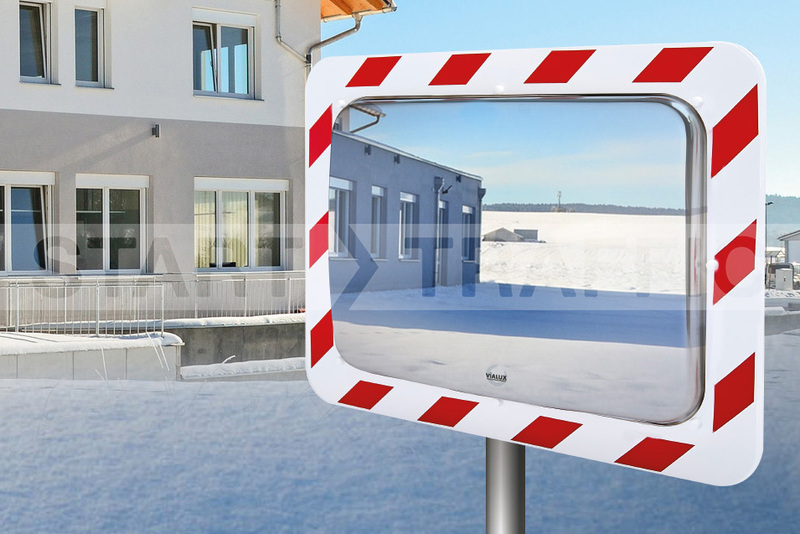 The Vialux stainless steel mirrors are very high quality and can withstand chemical, salt and harsh weather conditions. These mirrors are all two directional, meaning they have a slightly convex lens and give a good view around a 90-degree corner. This makes them perfect for use on driveways, blind corners, airport access roads and seaports. The stainless steel lens on these mirrors is impervious to UV degradation and is unbreakable. It produces a clear and undistorted image that is only achievable because of the high-quality machining. Because of how durable this stainless steel lens is we are happy to give this mirror a 10-year manufacturer backed warranty! This is the longest warranty that we offer on any of our traffic mirrors. 10-year warranty - peace of mind for years to come. There are several different sizes of this mirror available in both square and round formats. These sizes are detailed in the attached table and give the details of the maximum recommended viewing distance. The frames for these stainless traffic mirrors are white and made from a UV stabilised material that will not yellow or crack. The red panels on these mirrors are retroreflective and designed to catch the eye and provide contrast. Installation of these mirrors could not be easier, they come with all brackets included in the kit. There is a universal bracket that can be used to fix the mirror to either a wall or post. The kit allows post mounting on round posts (diameter 76-90mm) or rectangular posts (diameters of 60x80 or 80x80). If you are putting this mirror in a location that is very exposed and subject to constant temperature swings it may be worth considering the frost-free upgrade. This upgrade gives the mirror better surface temperature stability during changes in temperature, retarding the formation of frost or condensation. At the end of the day, a mirror is no good if the reflection cannot be seen! Call and ask about this upgrade today! Need assistance finding the right mirror for your needs? We have a wide range of safety mirrors that can be used in almost every application imaginable. From traffic mirrors to loss prevention mirrors for retail environments. Give our sales team a call today on 01905 794 875. If you are a business looking to improve safety on your site through the use of mirrors we may also be able to arrange a no obligation site survey!